Newton-le-Willows, Merseyside, November 5th, 2018 – Speedy Hire, the UK’s leading provider of tools and equipment hire and services, has announced another industry first. As part of its Capital Commitment initiative it has introduced a 4-hour delivery promise in London. 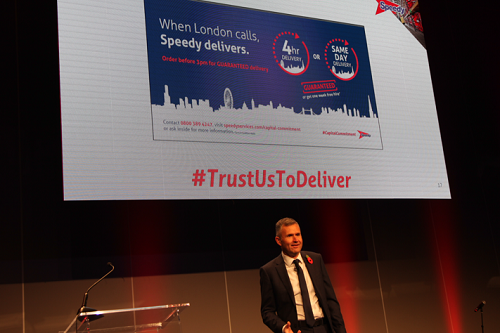 Speedy introduced Capital Commitment earlier this year, which guarantees customers a same day delivery service on any of Speedy’s top 50 products when ordered before 3pm. The 4-hour service delivery promise extends this offer and is a response to customers requiring near real-time service delivery. In addition to launching the 4-hour window, Speedy have extended the range of products available through this service from 50 to 52. These products can all be delivered within 4 hours, on time and in full, if ordered before 3pm. If Speedy fails to deliver against this service promise, customers will be granted one week’s free hire.